At Sabai Sabai we have created a relaxed environment that will make you feel as though you have been taken across the other side of the world for dinner. Sabai Sabai chefs were raised and trained in Thailand the 'land of smiles' . Their combined knowledge of flavours and Pan-Asian styles including Thai, Japanese and Chinese will provide a unique dining experience. 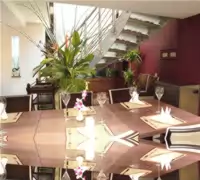 The split-level layout and beautiful decor of the bar and restaurant makes it an ideal venue for a romantic dinner, celebrations and private meetings. 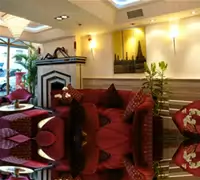 There are rich red sofas, exotic blooms, a casading water feature and a glass roof decorated with colourful tropical birds. 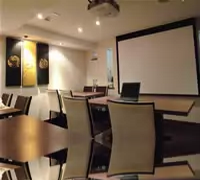 The restaurant also offers conference facilities for business needs. Sabai Sabai has the facilities and space to offer flexability for meetings and conferences and can take care of all the arrangements required for your event to be a memorable one. Whether it is an intimate occasion for family and friends, birthday celebrations, entertaining corporate guests or an office party. Sabai Sabai has the right ingredients to make the celebration one to remember. Please contact us to discuss any specific requirements, requests or ideas.